Here's a quick rundown of some things you might want to attend, participate in, write for, keep your eye on, etc. 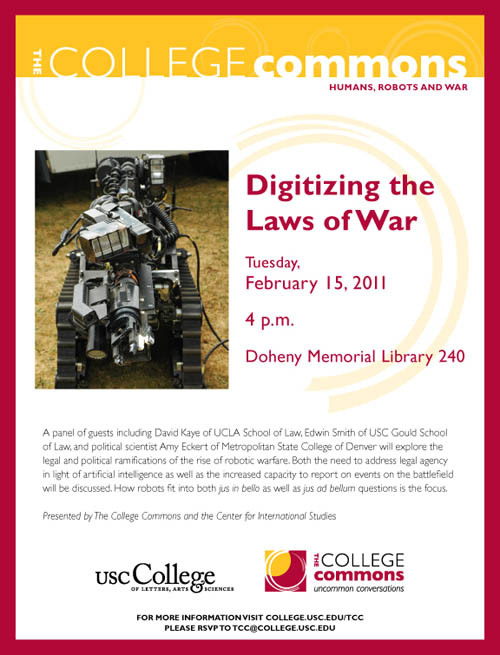 1) The discussion series Humans, Robots and War continues at 4pm this afternoon with "Digitizing the Laws of War" at USC: "A panel of guests including David Kaye of UCLA School of Law, Edwin Smith of USC Gould School of Law, and political scientist Amy Eckert of Metropolitan State College of Denver will explore the legal and political ramifications of the rise of robotic warfare. Both the need to address legal agency in light of artificial intelligence as well as the increased capacity to report on events on the battlefield will be discussed. How robots fit into both jus in bello as well as jus ad bellum questions is the focus." A sequel of sorts takes place on April 7: "Robotics, Warfare and Humanity." 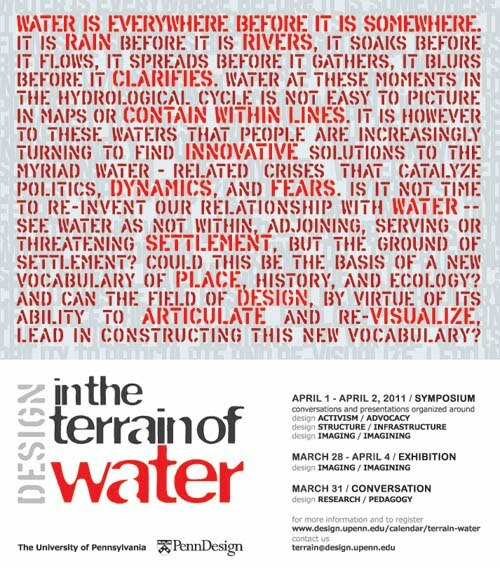 2) Also today, at 7pm, at the Arid Lands Institute in Burbank, Vinayak Bharne and Dilip da Cunha will participate in The Agency of Water: Scarcity, Abundance, and Design in Dialog, lecturing on, respectively, "Urbanism, Infrastructure & the Urban Water Crisis: Perspectives from Asia & the American Southwest" and "Negotiated Landscapes: Mississippi, Bangalore, and Mumbai." 3) As mentioned before, a forthcoming collection called Making a Geologic Turn, edited by Friends of the Pleistocene, is seeking contributions about, among many other things, how "contemporary artists, popular culture producers, and even philosophers are adding new layers of meaning and sensation to [the] 'geologic.'" Abstracts are due March 1, 2011. 4) The Heart of Texas Boundary Retracement takes place March 3-5, 2011, and it sounds fascinating: it "will be a modern-day search for original survey corners. (16 CEUs) By utilizing county record information, GLO field notes, working sketches and aerial photos, the original surveys can be positioned within a small search area. Licensed State Land Surveyors will be party chiefs to guide you through the process using information found on the ground. This area has not been bulldozed, chained or root plowed like many of the ranches in Texas, therefore providing a rare opportunity to find several of the original corners." The boundary retracement will take place on Wulff Cedar Creek Ranch, the geographic heart of Texas. 5) Thresholds 40 "invites projects, ideas, and beliefs in a variety of media, including scholarly papers, visual work, and philosophical treatises, that explore the dangerous and messy theme of the socially conscious project." 6) Speaking of water, meanwhile, on April 1-2, 2011, the University of Pennsylvania will be hosting a symposium called In the Terrain of Water: "Water is everywhere before it is somewhere. It is rain before it is rivers, it soaks before it flows, it spreads before it gathers, it blurs before it clarifies. Water at these moments in the hydrological cycle is not easy to picture in maps or contain within lines. It is however to these waters that people are increasingly turning to find innovative solutions to the myriad water-related crises that catalyze politics, dynamics, and fears. Is it not time to re-invent our relationship with water—see water as not within, adjoining, serving or threatening settlement, but the ground of settlement? Could this be the basis of a new vocabulary of place, history, and ecology? And can the field of design, by virtue of its ability to articulate and re-visualize, lead in constructing this new vocabulary?" Check out their site for more information. 7) "The Ambience conference focuses on the intersections and interfaces between technology, art and design. The first international conference in the Ambience series was held in Tampere, Finland in 2005. In Tampere 2005, the basic theme was 'Intelligent ambience, including intelligent textiles, smart garments, intelligent home and living environment.' In Borås 2008, it was 'Smart Textiles—Technology & Design' and, in Borås 2011, it will be the new expressional crossroads where art, design, architecture and technology meet: digital architecture, interaction design, new media art and smart textiles." Abstracts for a special issue of Studies in Material Thinking are due by April 1, 2011. 8) From June 22-23, 2011, catch Tunnel Design & Construction Asia 2011 in Singapore. 9) "We are seeking contributions from all disciplines to an American Studies essay collection on Dirt. Dirt is among the most material but also the most metaphorical and expressive of substances. This collection hopes to bring together essays that explore how people imagine, define, and employ the various concepts and realities of dirt. What does it mean to call something dirty? How do we understand dirt and its supposed opposite, cleanliness? How do we explain the points at which we draw the line between clean and dirty, what we embrace and what we refuse to touch? Drawing on multiple disciplines we hope to uncover and foreground the (often unconscious) centrality of the metaphors and actualities of dirt to U.S. cultures, values, and lived experiences." Essays are due December 11, 2011.